Don't let your home team draw these plumbing penalties. Super Bowl parties aren’t just about football; they’re also about friends, food and fun. But hosting such an event can tax your home’s plumbing — especially drains, garbage disposals and toilets. 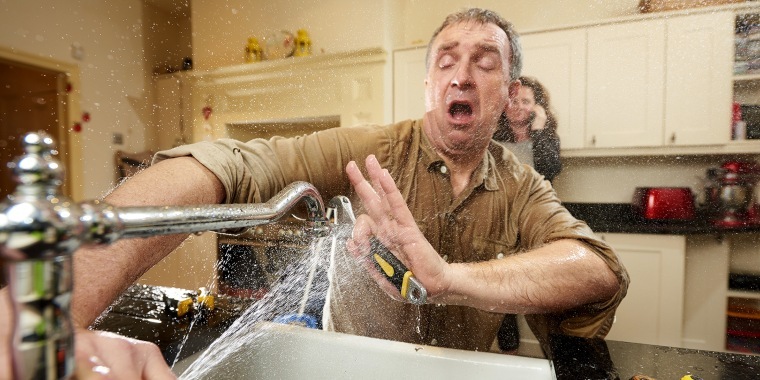 And we all know that when plumbing takes a hit, the whole team suffers! Score big with guests by keeping pipes open and running. Gary Findley, CEO of bluefrog Plumbing + Drain®, shares what plumbing plays work and what penalties you need to avoid this Sunday. Everyone loves wings but if you toss chicken bones down the garbage disposal, you’ll suffer a big penalty. Disposals cannot grind bones fine enough to pass safely through drain pipes. Throw those scraps in the garbage can instead. Every pass doesn’t have to be a touchdown and every garbage disposal load doesn’t have to be a full one. In fact, garbage disposals are more effective running short batches. Here’s another tip from Findley’s plumbing playbook: Keep the disposal and cold water running while processing scraps. Pileups aren't good when you're trying to score. Keep fibrous waste like celery and baked potato skins away from the garbage disposal. Celery strings tackle the disposal’s blades and potato skins blindside the cutting edges. Scrape leftover food from plates and serving dishes into the trash before washing or rinsing them. Too many scraps in the cleaning field will draw a costly plumbing penalty. When you’re finished frying wings, never pour leftover grease down the drain. It may seem harmless but as it moves down the drain pipes, it could solidify and cause clogs. Pour cooled grease and oil into a disposable container and sideline it in the garbage can. Single-ply toilet paper is great because it moves through plumbing pipes faster than the thicker kind. When there's a crowd at the house, use the lighter weight paper and you won’t get called for a personal foul. This article was originally published on Feb. 3, 2018 on TODAY.